I'll be honest, I'm bored of CGI animated movies. I go to see animated movies because I want to see the animation, not computer's doing their best real-life imitation. CGI animation all looks interchangeably round, overly textured, incorrectly lit and weightless – never mind that the stills of these movies almost always look better than the movie in motion. Yet, with the success of Pixar, Shrek (2001), and Ice Age (2002), everybody seems to have followed the money into the same-samey blandness of CGI. Disney helped nail that coffin down tight after they too announced they'd never bother with traditional animation again. To me, this is the equivalent of somebody in the 1800s saying: "Hey guys, we just invented the daguerreotype! Time to throw out all of those stupid Da Vinci and Turner paintings!" I mean, CGI animation, even decades in, is only now inching closer to achieving the cohesive photo realistic style they try so hard to strive for. (I didn't love Moana (2016) but I will admit they finally got the look, weight and texture of water right.) Even then, I'm sure in ten years I'll be wondering how I thought CGI animation today was even passable. Check out this concept art for Disney's Tangled (2010). 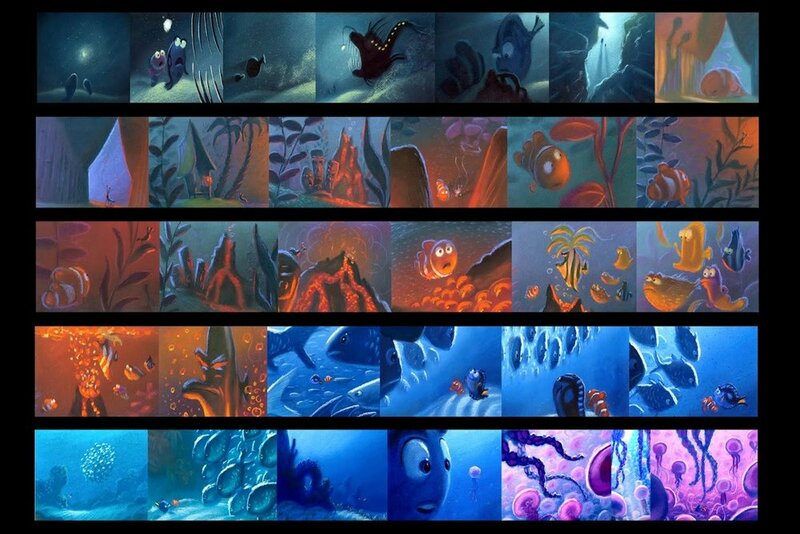 All of these are by the talented Lisa Keene, a veteran of Disney since the early 1980s. 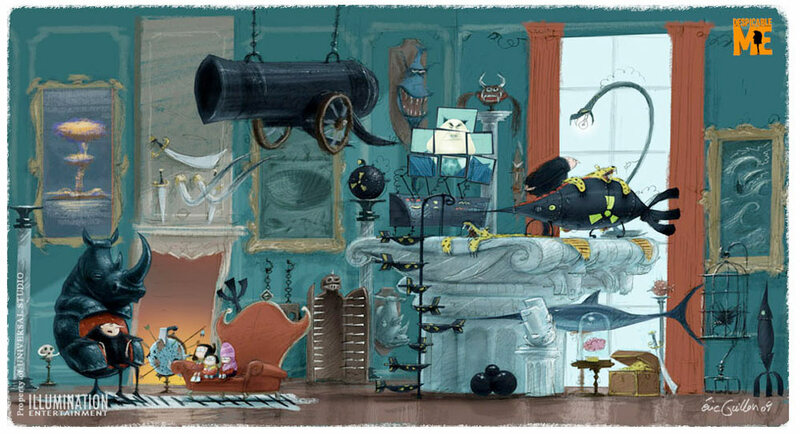 Lisa Keene started out as a background artist and worked her way over to Visual Development Artist as the years went by. Looking at her stunning artwork makes me so angry because it's so beautiful! Each of these just scream magical fairytale, through its lush greens, warm pinks, and glowing light. We're telling the classic story of Rapunzel here, how better to do that than by invoking classic European oil paintings? Her paintings also invoke the hey-day of Disney hand painted backgrounds, such as Snow White (1937) and Sleeping Beauty (1959). I actually was fairly impressed with the art direction on Tangled as it came out in the end, but knowing that we could have had an entire animated movie in the style of Jean-Honoré Fragonard or Maxfield Parrish makes me want to slam the door to my storybook tower room and weep into my silk pillows. The final CGI movie clearly incorporates some aspects of Keene's art and her influences, especially in how they use light and the finely rendered backgrounds, but it doesn't have the same glow, beauty, flow, and classic style that these paintings do. Julia Kalantarova was one of the concept artists for Frozen (2013) and I cannot Let It Go, as it were. Frozen went through several reincarnations in Disney until it was finally made, and Julia Kalantarova's influence on the final product is overt. Frozen is full of that hot pink and ice blue lighting, many-a shining ice crystal and glittery snowflakes abound. Yet, like Tangled, the flourish of the backgrounds is marred by the design of the stiff, round-faced CGI characters – the visual equivalent of sticking a McDonald's toy in the middle of the Sistine Chapel and pretending it works. What makes Kalantarova's concept art flow so well is that she draws the characters in the same style as the world she's creating – Elsa has angles, she also has a similar depth and delicate patterns that echo her surroundings. Her style also recalls midcentury art, but its use of vibrant colors unmistakably modernize it into its own unique thing. Who cares if any of these drawings look exactly like real snow? They're even better, they look like the dream of snow, the fantasy of snow! I mean, it's a story about a magic snow queen, not a documentary about Rochester, New York in December – show me the magic! Ralph Eggleston is one of the rock stars at Pixar – having been apart of the company since the early Toy Story (1995) days. You can see his handiwork on pretty much everything that's come since, either as an animator, art director, story board, or production designer. His style is easily recognized in part by his preference for chalk and pastels, as well as their digital visual equivalent. I first saw his concept art for Finding Nemo (2003) in a book store, walking past one of the Art of Finding Nemo books. I was just completely blown away by how stunning his artwork looked in comparison to how the movie came out. The use of pastels and chalk are just perfect for underwater scenes – the way these mediums blend really mimic the way light diffuses underwater. I was also impressed with how much more expressive and friendly the characters in his drawings look than the final product. With hand drawn animation you can play with proportions more easily in order to get not only expressions, but also emotions across more effectively. Again, this is an animated talking fish. Why are you cornering yourself into animating in fake eyebrows when just drawing the eyes slightly more oval gets that point across twofold? It makes me think of Holden Caulfield's line about how, in comparison to lifeless mechanical cars, "a horse is at least human, for God's sake." There is just so much more soul in Eggleston's artwork than the entire CGI movie. Who knew minions could have so much expressive character?! Eric Guillon is the storyboard artist, designer, and art director behind Despicable Me (2010), and he is also who you have to thank for the creation of minions. I'll be honest, I'm not a fan of minions, though I did see Despicable Me 2 (2013) and was pleasantly surprised by how non-offensive it was in comparison to its marketing campaign. 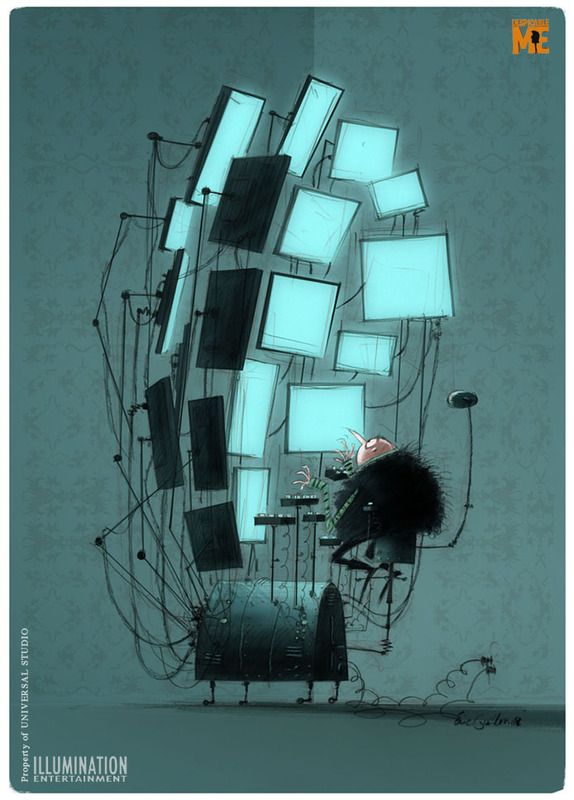 But that's all besides the point because looking at Eric Guillon's art also makes me angry – Despicable Me could have been a badass Edward Gorey meets André Franquin type throwback style animation! When I look at these illustrations I don't see the bland minions of internet meme or brightly colored, safe-for-children chunky toy design that the movie invokes. 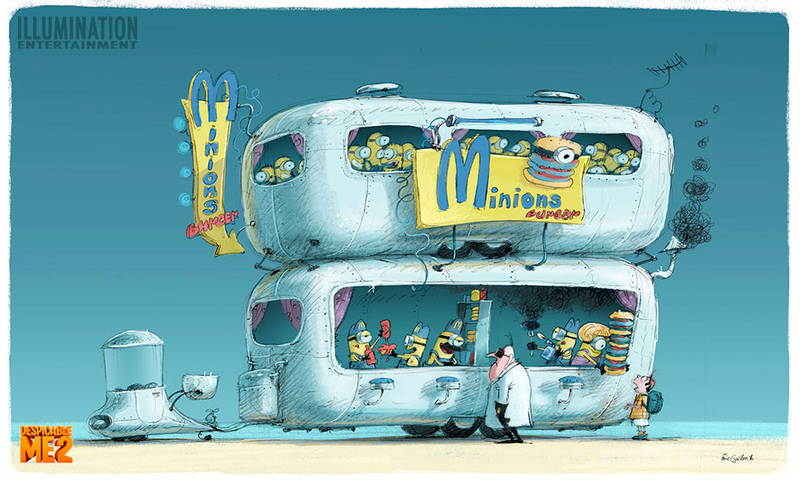 These minions walk the goofy yet expressive design line of early Simpsons art, Gru looks like an actual villain surrounded by those Gorey-esque machines and death traps, and the RVs and nod to fast-food in the last image remind me of the stark, foreboding world of Mad Max meets the Sunday funny pages. If you knew nothing about the plot for Despicable Me you never would have guessed from the movie stills that the minions were supposed to be evil helpers. Yet Guillon's style just oozes that prickly villain imagery with a touch of punk rock; everything is messy, frizzy, pointy, and boney. Unfortunately, it just sadly never made it through its translation to CGI. is anybody's guess. But until then, at least we have the beautiful concept art to look on and sigh wistfully about. Book recommendations: The Art of Tangled, The Art of Frozen, The Art of Finding Nemo, The Art of Pixar, The Art of Ratatouille, The Art of the Incredibles, and pretty much every "The Art of" Disney / Pixar book you can find. Also be sure to click the artists names for their websites and blogs.